Well I could run two special Poolates (see what I did there) sessions to celebrate the upcoming Summer Bank Holiday, or we could all just have the day off. Yes, let’s do that. No lunchtime or evening Pilates classes then this Monday 28th August. Ten other classes happening that week though. Check out the weekly class timetable for more details. In response to a number of recent requests for advice on the best how-to Pilates books, below are two I’d recommend. Both provide a useful guide to the basic classical repertoire of Pilates matwork exercises. Two thirds of the Isacowitz book is devoted to Pilates equipment exercises and as such may not prove to be the best buy for those just wanting to do the odd basic Pilates exercise at home. In class we do a much broader range of exercises than are covered in either of the two volumes. These books are intended merely to help you practise a few basic exercises at home for yourself between classes. I’ve included links to where you can buy the books new online. Cheaper ones can be found second-hand on eBay, or alternatively why not reserve them at the library and try before you buy. Pilates – 2nd Edition by Rael Isacowitz, paperback. 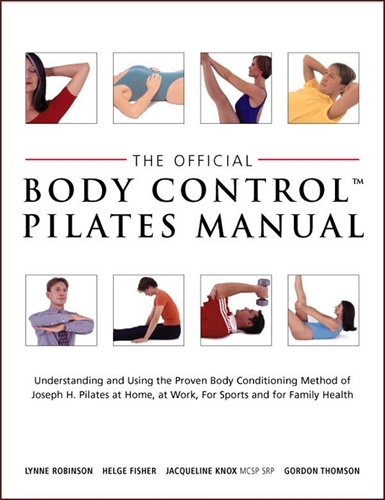 The Official Body Control Pilates Manual by Lynne Robinson, Gordon Thomson et al, hardback.